A plant with lovely flowers of a colour that match its name very well! 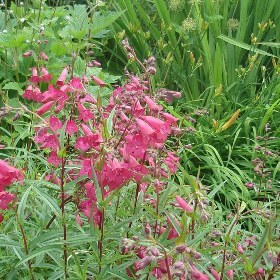 Resilient, long-lived and bedecked all summer with quantities of sumptuous purple-red flowers, Penstemon ‘Garnet’ is an excellent drought tolerant herbaceous perennial. One of the so-called border penstemons it bears clusters of chubby bee friendly, trumpet-shaped flowers from late spring through summer. The thigh-high flower stems arise from a shrubby base furnished with glossy lance-shaped evergreen leaves. The stems arch outward to give the plant greater overall breadth. This plant likes full sun and good drainage and is hardiest in soil that is somewhat moist in summer and dry in winter. Neutral to alkaline soils of moderate to low fertility suit it best. Always pinch back leggy young plants to encourage more basal branching. Deadhead promptly to promote secondary flowering and longevity and cut back in spring to encourage fresh growth from the woody base. Use ‘Garnet’ for long-term colour in the dry perennial border, or mass it with other drought-tolerant plants in raised beds, mounds or slopes.